Server error "Failed loading default license file!" I'm having the same issue. I looked through some old file logs and it looks like the license file might have expired expired or something? I'm using a free license (not NPL, 32 slot only). Last edited by dante696; September 3rd, 2018 at 06:58 AM. Which I already have the file in there and everything is set to accept. After this I tried starting it with ./ts3server_minimal_runscript.sh to see more details. Which I saw it tried to do this first "|WARNING |Accounting | |Unable to open licensekey.dat, falling back to limited functionality". After that I get the first error with not being able to load the default license file. I was just alerted that my free TS3 freebsd server is no longer online. I'm running it on a local freebsd box(technically on my pfSense box, but it's been working fine for several years). 2018-09-01 00:05:41.455334|CRITICAL|Accounting | |Failed loading default license file! I have not made any changes to the install and haven't even touched pfSense in a while, this happened randomly about half an hour ago. I tried google searching that license error and got no results. Log says "Unable to open licensekey.dat" as well. Not sure how to fix because I've never had a licensekey.dat file and have no idea why my server is suddenly trying and failing to load it. Last edited by johnnydotexe; September 1st, 2018 at 01:17 AM. I already thought it has to be a failure from teamspeak's own licenses as I didn't change anything. Updating to 3.3.1 appears to have fixed the issue. I don't know why my server would suddenly and randomly take itself offline and refuse to come back online due to a license issue. Can anyone from tech support explain why this happened and how to keep it from happening in the future? I was maybe 1 version behind on the server and I'm not exactly thrilled that my server, without my touching it, can decide to stop working over a license issue. 2018-09-01 00:21:36.709628|CRITICAL|Accounting | |Failed loading default license file! I didnt change any settings and/or files to the server. It just came up randomly today. 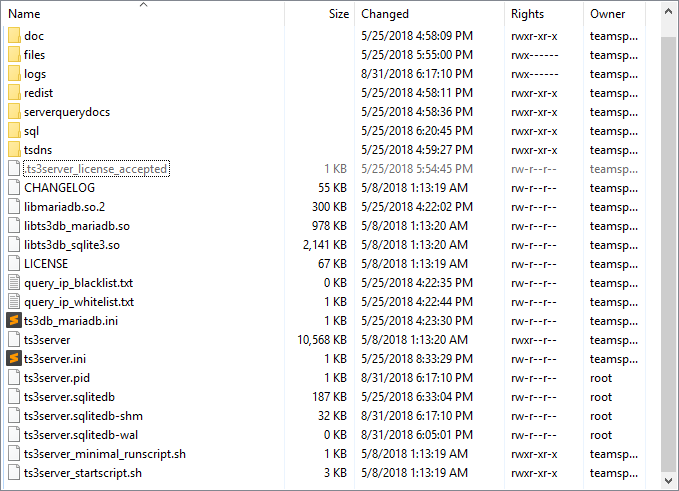 I havent used a license for the server (32 clients max) and I cant find licensekey.dat in my server directory. [[email protected] teamspeak3-server]# 2018-09-01 00:48:56.331386|CRITICAL|Accounting | |Failed loading default license file! 2018-09-01 00:48:56.309874|WARNING |ServerLibPriv | |The system locale is set to "C" this can cause unexpected behavior. We advice you to repair your locale! 2018-09-01 00:48:56.331386|CRITICAL|Accounting | |Failed loading default license file! I have never had a license so I'm not sure why this issues suddenly started. After viewing a log from a month ago it appears a default license is created with an expiration date. How do I remove/replace this "default license". Again, I have no need for anything other than the free 32 slot version of the server. Latest log and a log from over a month ago are attached via jpg image. 2018-09-01 01:27:22.831938|CRITICAL|Accounting    |   |Failed loading default license file! 2018-09-01 01:00:34.299252|CRITICAL|Accounting | |Failed loading default license file! /opt/teamspeak3-server# 2018-09-01 01:17:10.678065|CRITICAL|Accounting | |Failed loading default license file! I tried to provide as much information as is necessary, but please ask if anything else in needed of me. I'm running the latest teamspeak server on debian 8.1 linux root server. The Server stoppet working, then i updated to the latest version. Since then i cant start it anymore. 2018-09-01 01:48:18.313573|INFO |DatabaseQuery | |database busy, waiting for finishing index tasks, may take some time! 2018-09-01 01:48:40.946739|INFO |DatabaseQuery | |database busy, waiting for finishing index tasks, may take some time! 2018-09-01 00:55:50.516514|CRITICAL|Accounting | |Failed loading default license file! So it looks like there was a hardcoded license ending date in version 3.2 that kicked in tonight. FWIW, it looks like 3.3.1 also has a fixed expiration. Same here. I tried updating and reinstalling. It's the exact same error. Having the exact same issue and error. Started within the past 24 hours. Windows 10 with free license.